Below I have expandable sections with the text from the prior posts that detail this experiment. I hypothesize resistance training reduces LDL cholesterol due to higher endocytosis of LDL particles by non-hepatic tissues, this includes skeletal muscle for growth and repair. 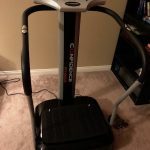 I will engage in a workout session with a Vibration Plate Power Plus. I will be working all upper body with the intent to become as sore as is reasonable without risk of injury. I will keep track of all time allotments and settings for data and potential reproducibility. I’m awaiting the baseline to return to this roughly this level before “triggering” another intervention of another intense workout. I figure a 3% offset should be sufficient. Thus, if either the TC comes to or above 370 (97% of 382) or LDL-C comes to or above 305 (97% of 315) for the 10am reading, then I’ll initiate the intervention on the following day. Intervention Phase I: Completed four exercises on the vibration plate for 20 minutes. 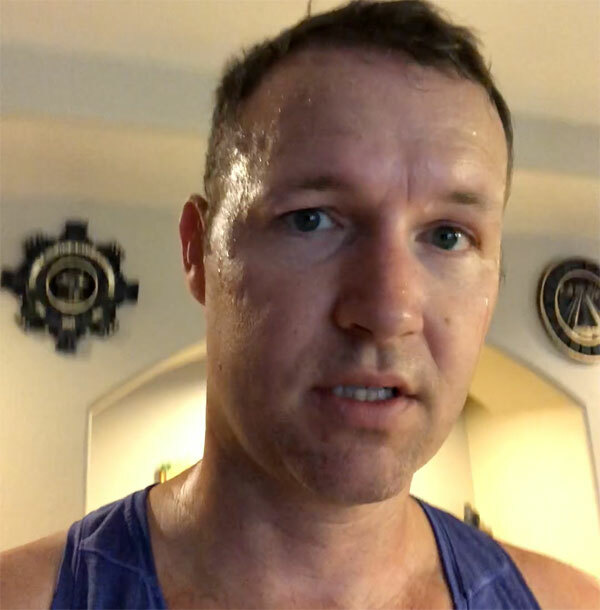 Completed half of a free exercise video on YouTube for 15 minutes. Played 20 minutes of Knockout League for PSVR (Lots of rapid arm swinging, variety of motion), one lap around my block with a 500ml water bottle in each hand. Intervention Phase II: Went to a nearby gym and had 5 minutes of warmup cardio, then 45 minutes on various upper body weights with extra emphasis on the arms and chest. 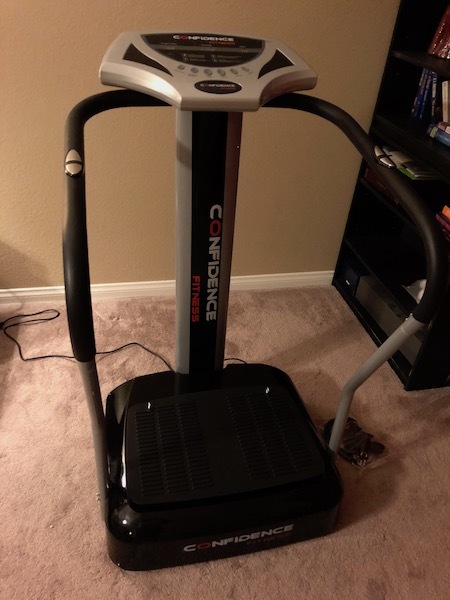 I did another 15 minutes on the vibration plate afterward. 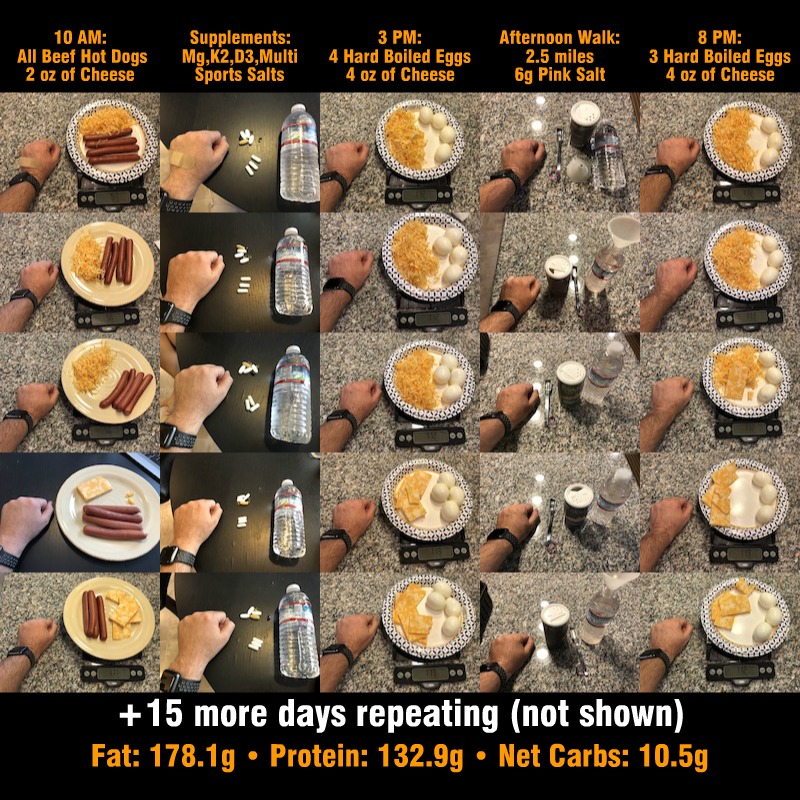 As many who follow me already know, I consume a lot of salt in my normal keto diet, usually targeting about 10g a day (no, that’s not a typo). 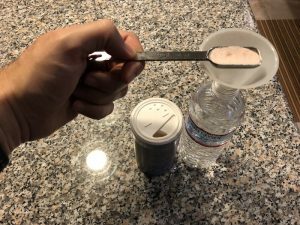 At the beginning of the washout phase, I was consuming roughly 5g with my meals on top of a Sports Salts supplement of 1.5 servings at the 10am meal. Alas, this was not enough. I began experiencing leg cramps a couple days in and so added an additional teaspoon (6g) of pink salt to water each day and this resolved the issues. But so you know, this is actually wrong. 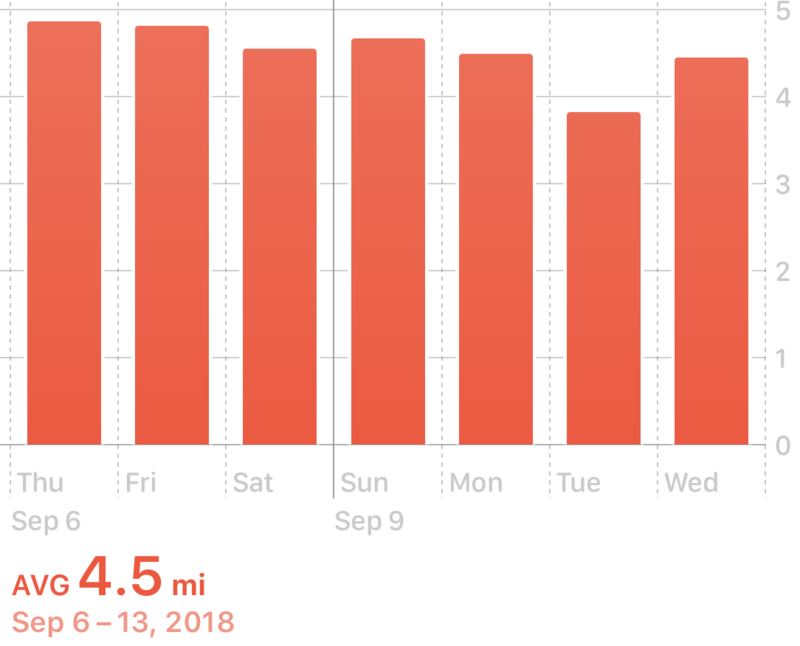 I didn’t average 4.5 miles of walking each day, not even close. However, I don’t mind if the iOS devices are wrong so long as it is consistent in its magnitude of overestimation so I can at least see if my pattern is proving stable. I did find myself getting anxious for the walk each day. As tedious constants go from one moment to the next, this was always the activity I most looked forward to each day. There were a number of times I wanted to tack on another mile or two. This was taken just before my 10am “feeding” each morning. These markers mostly represent a single data point. 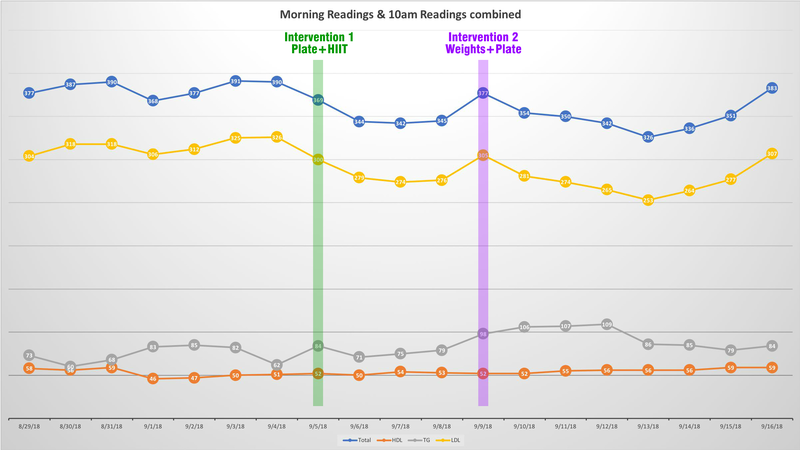 But on “key” days, opted to do several in a row for additional redundancy (such as on the morning following each intervention day) and averaged the result together. Needless to say, I really, really love these graphs! All that robotic, tedious living from day-to-day really paid off in a big way. 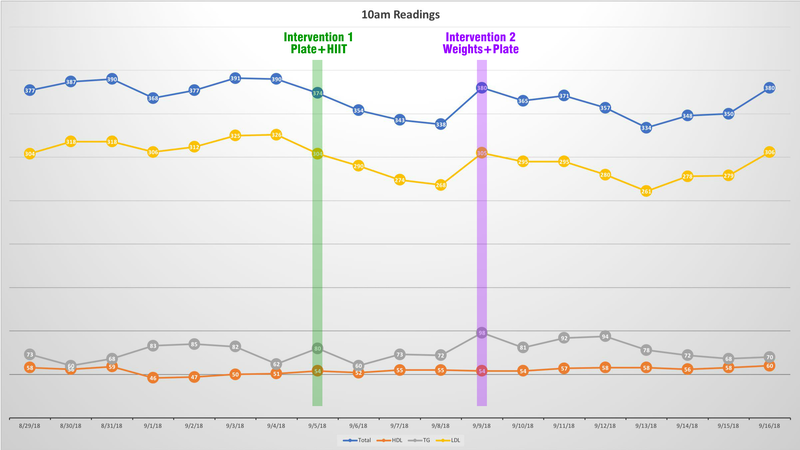 As you can see, my TGs following that 9/9 intervention was especially high when I woke up, but dropped substantially back to baseline by 10am. When did I wake up? Well, I always try to make it a rule to take my readings within a half hour of being “fully awake”. Pretty much it’s the first thing I do when I get up — but I’ll concede I often check my phone for a little bit before leaving the bed itself. So the CC times taken each of those mornings were 6:41am, 6:55am, and 6:56am, respectively. Thus, I had about a 3 hour gap between the morning and 10am readings those days. I’ve had two other occasions where I observed both a morning and 10am reading: The Capstone and Added Sugar Experiments. But this temporary spike was not observed in either one. In fact, my triglycerides very, very rarely climb into the triple digits in the first place, particularly on a very low carb, ketogenic diet. As my second intervention led to more and longer-lasting soreness given I took to the weights and hammered it out at a gym, I expected a bit more intensive repair. More repair => more LDL needed => more VLDL secretion => more overall TG detected… and cleared rapidly? 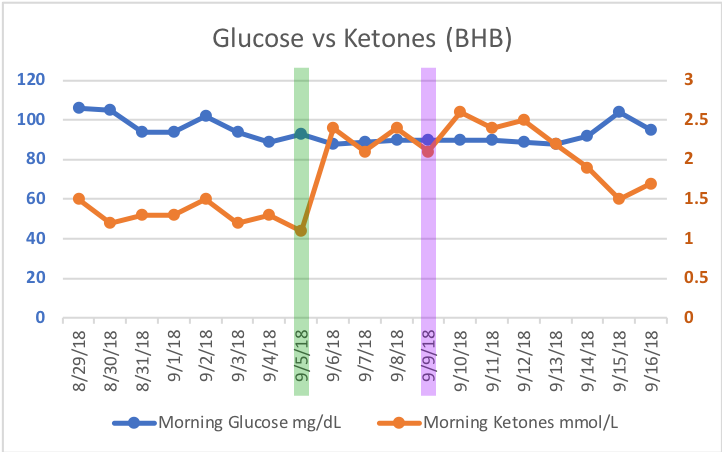 So my ketones hovered between 1.2 to 1.5 fairly reliably until I hit the first intervention and boom — 2.1 to 2.5 until the 14th, right about when my LDL started to come back up from it’s low of the second intervention. Without question, this experiment has been very challenging to execute, as all very long experiments typically are. That said, this certainly one of my favorites of all time. For one, I had been putting off all resistance training for “the next few months” for over two years as I suspected it would impact my lipids. So it was a can I kept kicking down the road while focusing on the set of experiments at hand. Yes, I already had hints I might be right from my marathon training, but how sure could I be? Moreover, this gives considerable evidence to the pattern I’ve speculated on this entire time as to why many keto bodybuilders will have lower LDL-C/-P than their runner/yoga/cardio counterparts. Can I be sure this is mostly muscle tissue endocytosis? Certainly not. But for me, this is the best evidence I’ve been able to generate to date to demonstrate that possibility. Could the higher morning trig be related to the dawn phenomenon? Cortisol is raised in the morning, it doesn’t just causes the release of glucose but also trigs. Sure — except the reason for the excitement was how it was only present in that short, specific window of time. 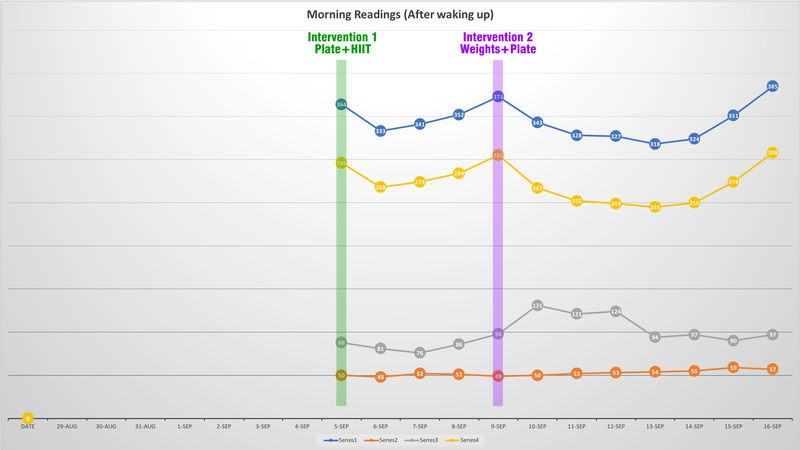 The reason I brought up the dawn phenomenon is because of the difference between the morning and 10 am readings. Could it also be that the endocytosis is primarily taking part during the night when the body tries to perform the repair and upon waking lowers this repair? Energy needs to be preserved for our activities throughout the day. One other point I noticed is that, at least with the second intervention, ketones and triglycerides follow trend. Since we are talking about an energy system, it would make sense that there is an overall increased need for energy. Raw material (fatty acids, cholesterol) to build/repair cells but also energy (fatty acids, ketones, glucose) to process the raw material and construct new material. Also I bet your body adapted to becoming more glucose sparing since the glucose didn’t really drop below 90 but it was definitely pushed down to stay at that level. This is just my interpretation but given the rise in ketones and fatty acids, slightly pressed glucose. Very interesting stuff! Yep — very close to my thoughts as well. This is why the experiment has proven to be one of my favorites already! That’s some discipline. Way to go Dave. These N 1 ‘s are turning all we were taught, upside down. This is what big, food and pharma should be doing. But no $$ In keeping us healthy. Thankfully we have you as our Guinea pig! Great stuff…..I’m wondering if your work here might explain something I experienced this week. I’m an active 65 YO who’s been ketogenic for a couple of years and more carnivore the last 6 months or so. 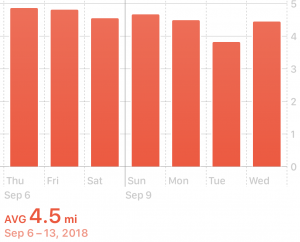 I had some bloodwork done last week….within an hour of completing 2 hours of vigorous tennis. Not quite HIIT but quite the workout. My TG’s came in at 117 (81 in May 2018), when they more typically run 59 to 85. Wondering if the pre-lab exercise explains the jump? Keep up the good work and I’m happy to continue my Patreon monthly pledge! TG is a pretty volatile marker, so a change of 20 or even 30% wouldn’t shock me too much. But indeed, your story + blood work makes a lot of sense in this context. I may take a post workout lipid draw with my CardioChek at some point. … from the frying pan into the fire ! Great work, again. Any thoughts on the TG morning and 10AM values from the 17th? Nice catch — I didn’t actually notice that. Short answer: no — I don’t have any thoughts on that other than it happened to be a very stressful evening the night before due to some work stuff I was taking care of. Would be interesting if that was in some way relevant.